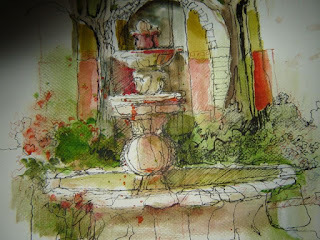 Am home from San Miquel, picture was done in courtyard of the center for the arts. More art to come. This is just a watercolor sketch. 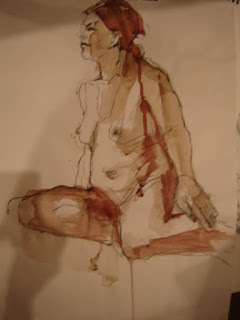 thought I would post some drawings from life drawing today...enjoy. 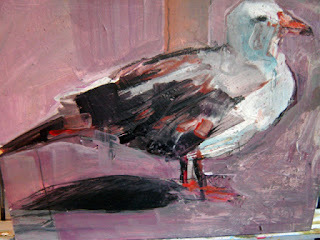 am posting an almost finished ptg done last nite. I will work on it when I get back from San Miquel, Mexico. Expect to get many photos and sketches for material in the future. Will be there for a week, so won't be able to post much during the next few days. Ole! thoughts of warm weather and beaches are filling my head. I am currently in a show at Wynne House Gallery in Huntsville, Texas. This will be up until June 28.
love these model sessions...time to get creative. 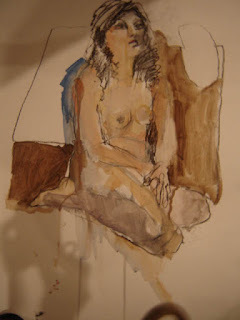 We did the Market Street Art show last weekend, sold 2 of my nudes, it is amazing the number of people that like nudes. Will post some in the future. Contracted today to show at Masons on Main, which is probably the oldest gallery in Old Town Spring and the most popular. Plan to paint there for the public sometimes, which should be alot of fun. Let's take a look at latest work.